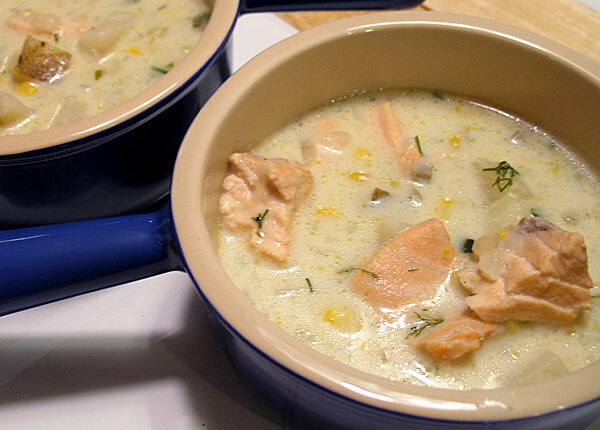 A very special guest post this evening from Lisa’s brother Chris (yes, another Chris…) and his girlfriend Jenn — a delicious Salmon Chowder from The Ultimate Soup Bible. C&J made an enormous cauldron of the chowder that fed nine or ten lucky souls over the course of two nights. I only had my point-and-shoot camera with me, so I wasn’t able to get as good a picture of the chowder as I normally would — guess, we’ll just have to make it ourselves! (As if we really needed an excuse…) We served the chowder with a few sides and salads we’ve made before, including these roasted yams, a salad featuring arugula and roasted bell peppers, and one featuring layered beets and avocados.